There are plenty of signs that the way we have typically described gender may be dying before our very eyes. In Austria last year, the winner of Eurovision’s popular song contest was a 26 year old drag queen with a beard named Conchita Wurst. Earlier this year, Sweden officially became the first country to add a gender neutral pronoun to its official dictionary. At the same time, Facebook expanded their already broad 58 gender options to now allow a custom unlimited field for users to designate their own gender identities. 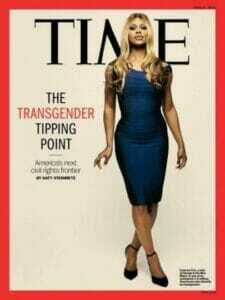 In May, Time magazine published a cover story about the “Transgender Tipping Point” featuring Orange Is The New Black star Laverne Cox. And just last week Target stopped labeling toys as being for boys or girls and instituted gender free labeling. All of this flux is creating a paradox of interesting questions for anyone selling any product traditionally targeted at one gender or another. Are you ready to sell dolls to boys or footballs to girls? How about bras to men or beer to women? 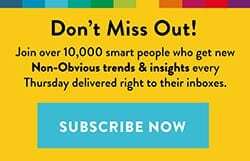 The traditional lines that were once drawn so definitively around broad product categories that entire marketing teams and experts even branded themselves as experts in marketing to women or men are now breaking down. Earlier today while speaking at a gathering of the top digital marketers and brands in Mexico for IAB Conecta 2015, I shared some insights on trends and the art of predicting the future. The rise of women and examples of gender free labeling of toys or the rise of super heroines in entertainment are themes I have spoken and written about before in my trend report from last year. Now nearly two years later the trend has broadened to a wider questioning and reinvention of the role of gender itself in they identity of individuals and consumers. Pam Grossman from Getty Images, another speaker at IAB Conecta, added even more context to this idea speaking about trends in visual images being used and searched for by brands and agencies creating global marketing and advertising. Inspired by the search and image usage data Getty collects from sales of stock imagery, one of the biggest visual trends she spotlighted was a trend named “GenderBlend” – the gradual blurring of gender identity in images that were being requested and purchased from Getty’s vast catalog. This trend even led Getty to create their “Lean In Collection” depicting women in powerful situations and poses. So what does this mean for brands who still want to promote products to consumers who are rethinking these traditional gender descriptions? Rethink gender roles in imagery – One theme that came through clearly from Pam’s presentation about Getty Images was that there is now a vast collection of images showing men and women in equal business situations and leaving behind traditional roles. The global searches for “Dads Changing Diapers,” for example, has increased 7x in the past three years. As this search for new types of imagery continues, it will be important to find and use evolved images illustrating new gender roles and relationships to influence consumers. Expand your target market – A decade ago, Harley Davidson featured scantily clad women to sell motorcycles to men. Today they have a robust and successful division focused on marketing and selling bikes to women. What their example proves is that history and legacy don’t need to be forgotten in order to evolve and get smarter. 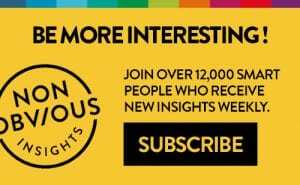 What if you could double your target market overnight, simply by thinking more broadly about who your customers really are? Make gender irrelevant – Part of the challenge when it comes to shifting our thinking on marketing is realizing just how baked in gender stereotypes are to the packaging and descriptions of the products we buy. Do you unintentionally use “he” when describing your customer? Do your two product options really need to be blue and pink? Sometimes the best way to make your marketing more broadly appealing is to make the role of gender irrelevant within it. 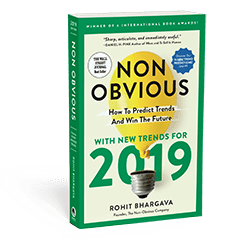 Rohit Bhargava is a trend curator and the WSJ best selling author of Non-Obvious – a new book about business trends and how to predict the future. Previously trends he has written about include the rise of powerful women, optimistic aging, and anti-stereotyping. His trend research and an excerpt of his latest book are available at www.nonobviousbook.com.